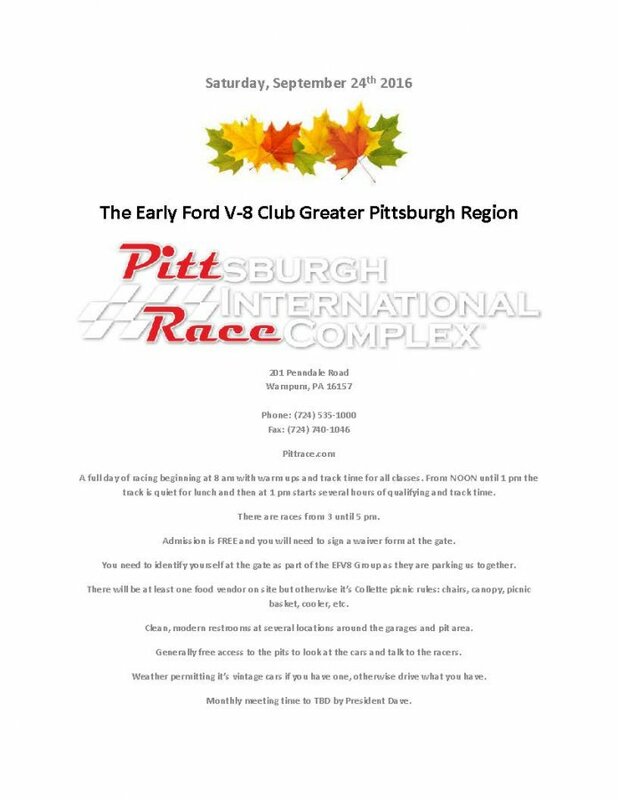 A full day of racing beginning at 8 am with warm ups and track time for all classes. From NOON until 1 pm the track is quiet for lunch and then at 1 pm starts several hours of qualifying and track time. There are races from 3 until 5 pm. Admission is FREE and you will need to sign a waiver form at the gate. You need to identify yourself at the gate as part of the EFV8 Group as they are parking us together. There will be at least one food vendor on site but otherwise it’s Collette picnic rules: chairs, canopy, picnic basket, cooler, etc. Clean, modern restrooms at several locations around the garages and pit area. Generally free access to the pits to look at the cars and talk to the racers. Weather permitting it’s vintage cars if you have one, otherwise drive what you have.